THE CURE FOR THE COMMON COLD HAS BEEN OFFERED BY MANY AND IN MANY FORMS. Andrew H collects in the area of health and so his collection documents many medicinal problem solvers. 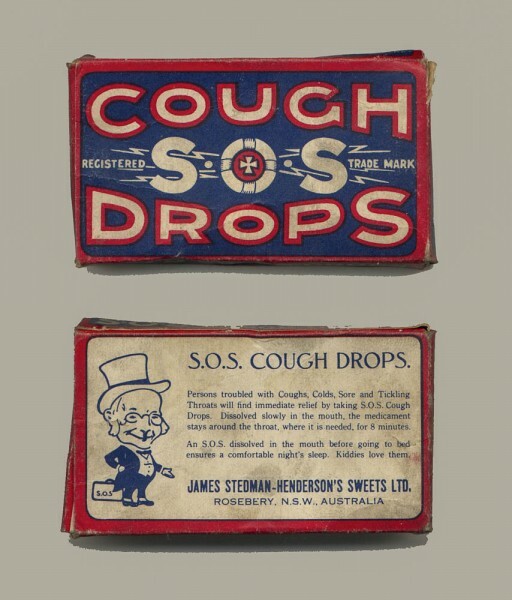 It looks like in colonial Australia, one of the sources of the solution for coughs and colds was the confectioner. These jujubes claim the approval of the medical faculty. Label, 8 x 20 cm. Collection of Andrew H.
The reference to Medical Faculty approval may be because T.H. Nott appears to be an early Melbourne confectioner, based in Collins Street. He was operating in the 1850s and there was still a T.H. Nott shopfront in the early 1900s and a business of that name in 1945. Sir-With your permission, I should like to point out how unjust in its operation the proposal for a universal half holiday will be to the fourth schedule shopkeepers, and particularly confectioners, 75 per cent of whose business is purely a chance trade dependent mostly on weather conditions &.c and what by such mischances is lost on one day is not by any means made up again. Maybe this accounts for the involvement of other confectioners. Cough drop package, circa 1922-24. 5 x 8 x 1.5 cm. Collection of Andrew H.
S.O.S. cough drops (manufactured by James Stedman-Henderson‘s Sweets Ltd of Rosebery, N.S.W.). This company was establised in 1875 by James Stedman Henderson who began in the confectionery trade as a 14 year old. The company was family run and became incorporated in 1920. A newspaper advertisement for the product first appears in Sydney newspapers in August 1922. A newspaper advertisement in 1924 advises that the product is now made at Sweetacres, so the displayed package probably dates from 1922-1924. This product was sold through confectioners and pharmacies. Sweetacres is more famous for making ‘Minties’. Greathead’s Mixture is a reputedly a ‘quintessentially Australian invention’. In 1875 it was patented by Robert Greathead, a chemist of Abbotsford Street, North Melbourne. This mixture was advertised as a treatment for diphtheria, scarlet fever and other ills. This is a cure-all recommended to mothers and fathers. Blotter, 10 x 25.8 cm. Collection of Andrew H.
Using the National Library’s Trove, the following selection of advertisement for Greathead’s Mixture are found. A short time ago, the son of the station master at Seymour suffered from a severe attack of diphtheria. Medical men were called in, shook their heads, and said that there were no hopes, telling the child’s parents that they might order its coffin. At this critical juncture, when the child’s life was despaired of a bottle of Greathead’s Mixture was tried, with the result that the sufferer was not only saved, but in a few weeks was perfectly well. This is only one of many thousands of cases treated success fully by Greathead’s Mixture-2s. 6d. per Bottle. From Chemists and storekeepers through out the district. Robert Greatshead 51 Chetwynd Street, North Melbourne. The Death Rate for Fevers has been considerably Reduced by the use of GREATHEAD’S MIXTURE For Diphtheria, Typhoid, Scarlet, influenza, and other Fevers, Quinsy, Croup, Bronchitis, Coughs, Colds and Liver Complaints. A CURE WHICH HAS NEVER KNOWN TO FAIL. 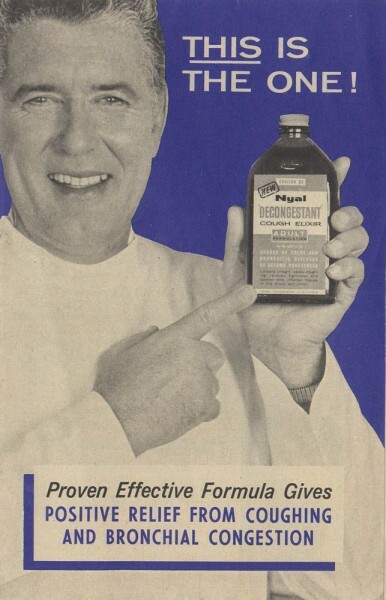 This mixture is now being Extensively Used and is Recommended by the Medical Faculty, Scientists, Clergymen, &c., who one and all pronounce it to be the MEDICAL MARVEL OF THE AGE. …..Science has demonstrated that Microbes or living germs are the cause of most diseases. GREATHEAD’S MIXTURE kills the Microbe with the greatest certainty, and recovery immediately commences. Children love Greatheads with honey. STATISTICS SHOW THAT THROUGH THE RAVAGES OF COMMON COLDS, SORE THROATS, AND ‘FLU, THOUSANDS ARE WEAKENED PHYSICALLY EACH YEAR. Colds and ‘flu arc caused by bacteria entering the system through the nose and throat. Your greatest protection and remedy is GREATHEAD’S MIXTURE. It has proved itself (for over 60 years) as indispensable in any household. Children love GREATHEAD’S when mixed with honey. It is so palatable and easy to take. Have a family-size bottle of GREATHEAD’S always on hand. Obtainable at all Chemists and Stores. 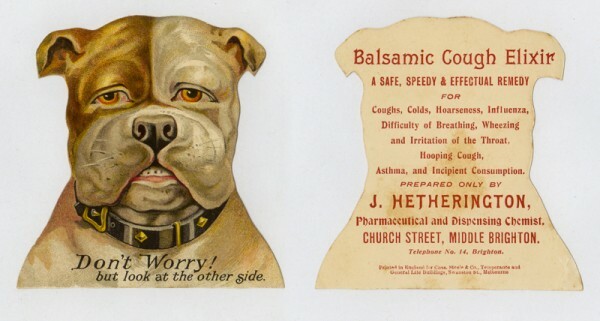 The only Trove listed advertisements for this Balsamic cough elixir (produced by Mr Hetherington) are all published in 1896. The advertisements use the same words and address and telephone number. Card advertising product prepared by the local pharmacist. Circa 1896. 10 x 10 cm. Collection of Andrew H.
Larger file to best show quality of artwork. Two products directed to the winter illnesses’ market are produced with an endorsement from the ‘Australian Pharmacies Associated. Australia.’ This might be a move away from manufacture and endorsement by individual pharmacists. Two products directed to the winter illnesses’ market. Baron’s label, circa 1930s-40s, 9.5 x 4.5 cm. Flugon label, circa 1920s-30s, 12 x 4.5 cm. Collection of Andrew H.
The ‘ ‘Australian Pharmacies Associated.’ is referred to in advertising only between 1929 and 1942. Baron’s was advertised in Australian newspapers between 1935 and 1942. 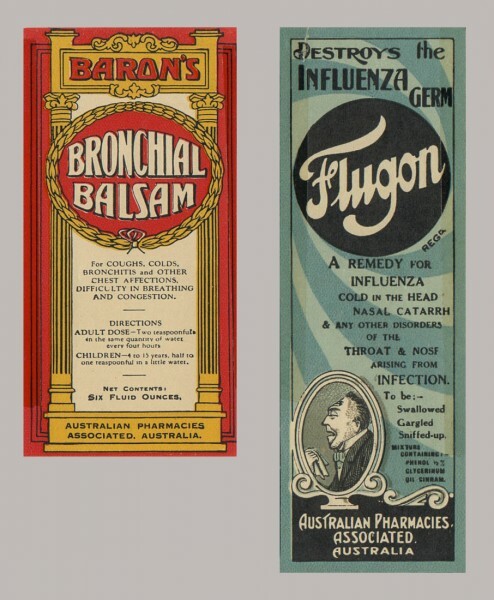 Flugon was advertised in the 1920s and 1930s. The white-coated man advises ‘This is the one’. Brochure, 16.5 x 10.5 cm. Collection of Andrew H.
Not only does this brochure have a professional in the white coat recommending the product but the back page has a blank spot for the local pharmacist to put his stamp to confirm that he or she recommends the product. Collecting ephemera from an early age, initially across a broad subject area, and later working in the pharmaceutical industry, determined that my collecting interests eventually jelled with a career path, and helped me focus on the social history of the wider health sector. Like many industries with noble intentions that spurn both a large bureaucracy, and a degree of opportunism, health and medicine generally throw up a myriad of paper collectables. 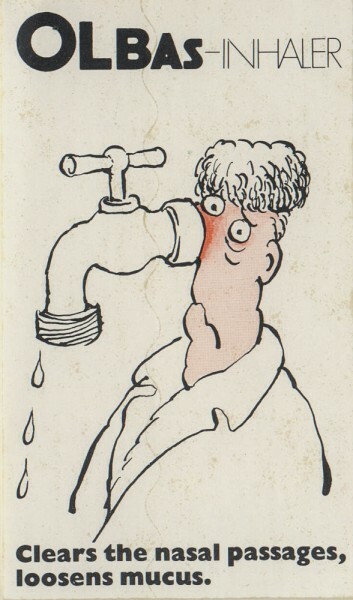 The ephemera of public health provides many examples of the competing interests in a society and an economy in the provision of services, and changing attitudes towards the provision of those services. At the basic level of service are the perfunctory Health Department handbills proclaiming the outbreak of pandemics, such as the 1918-20 Spanish influenza epidemic. A desire by the authorities to get the message out about the disease, without creating mass panic. 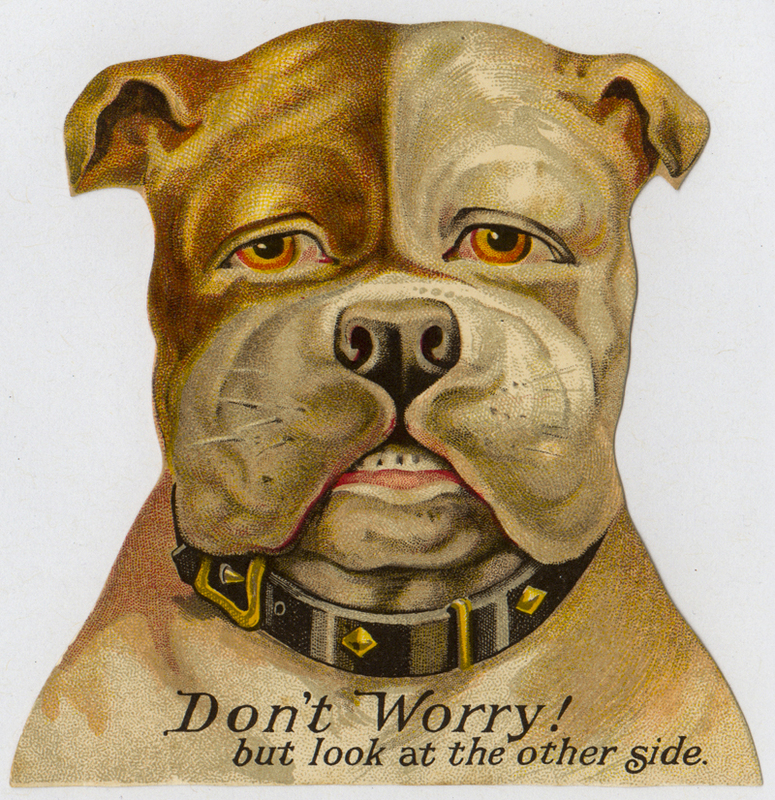 Aptly juxtaposed in the more recent anti-terrorism fridge magnet message “BE ALERT, NOT ALARMED”; which probably ended up contributing to an unintended level of fear anyway! Blatant cynicism aside, collecting in the field of health and medicine continues to bring to light some wonderful items, that provide a rich vein of the social history of our past and present. One of the criteria I believe that continues to heighten the contribution of ephemera as such a rich source of material for collectors and researchers(often one and the same person), that can’t really be replicated any other way. Advertisement for a modern inhaler. Sticker, 10.5 x 6 cm. Collection of Andrew H.
The Prince Henry’s Trained Nurses Association, Nursing and Medical Museum, Little Bay NSW. I found a whitish green glass bottle under the house. It is about 20cm tall with a squarish bottom. It has Greathead’s Mixture on the side. I was wondering if you could provide me with some info about it please. Age, etc. Thankyou.